I have something a little different for you today. 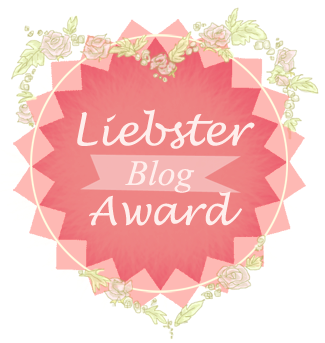 So, I was nominated for a Liebster Award by the lovely Vicky aka The Polish List. I had absolutely no idea what this was; I'm still such a newbie to blogging (I only started in January). So I decided to do a little investigating and read Vicky's post when she later published it. So basically, its an award for bloggers from other bloggers. I was so flattered to be nominated by Vicky for this considering I'm still such a newbie and half of the time I wonder if I'm doing things right. Her blog is just incredible, I'm honored she thinks my blog is good enough. Thank you so much Vicky! Well, as I said above, its an award for bloggers, from other bloggers (with German origins). It is similar in principle to a chain letter in the sense that it is passed forward to other bloggers (you can either choose to accept it or reject it). Display the award on your blog (by displaying it in your post). Answer the 11 questions from the person who nominated you. Create a list of 11 questions for your nominees. Inform the blogs you have nominated. ** The nominated blogs must have less than 200 followers. 1. What are your favourite sweets? 2. What is your favourite high street store? Shopping! Now here is something I love! Like seriously I have a major shopping problem, which makes this another difficult question as I love to shop everywhere. My favourites would have to be New Look, Miss Selfridge, River Island, Forever 21 and Primark (who doesn't love a bargain!?). 3. What is your favourite beauty product ever? Oooh another tricky one... These are good questions Vicky! Well as you all already know I love anything nail polish related but I think my favourite beauty product would be make-up related. Its a tie between my Beauty Blender, Liz Earle Cleanse & Polish and Anastasia Beverly Hills Dip Brow. My beauty blender has transformed my make-up application. For any of you wondering it is a tear shaped sponge and is just amazing! Cleanse & Polish is just WOW! Hands down the best cleanser and it removes all my makeup so my skin is super clean and soft! Lastly, Dip Brow. This stuff is incredible! I could not sing its praises more. I have the worst eyebrows ever. They are so sparse, I basically look like I have half an eyebrow. This stuff fills in my brows perfectly, its so precise and they stay all day. 5. What is your favourite blog and why? Another tricky one! This is just so hard! I love beauty blogs and I love nail art blogs. I don't think I could choose just one! I really love +Inthefrow +HelloOctoberxo +My Pale Skin in terms of beauty blogs. I literally can't choose a single nail art blog because there are so many talented ladies! Yet another difficult one. I LOVE reading so much! I've read a lot of incredible books but I think my favourite would have to be the Harry Potter series because it was just my childhood! I've read the series so many times I've lost count. 7. What is your favourite thing about yourself? This question is just impossible! I always pick out my flaws; I could tell you a million things I dislike about myself. I always struggle with the positives. I literally have no idea - epic fail at this question. 8. Favourite female and male celebrity? I don't really think there's any celebrities I particularly really idolise. I mean there are celebrities I like but I don't really follow any one in particular. 9. Top three television programmes? So difficult! I love so many... I get kinda hooked with them. At the minute I'm loving The Fosters, Pretty Little Liars and Vampire Diaries. But I also have some favourites which are either on season break or have completely finished such as Gossip Girl, One Tree Hill, The OC, Orange is the New black and Scandal. 10. If you were stuck on a desert island and could only have 3 items what would they be? I'm gonna have to be practical here and say a knife, a lighter and a water purifier as I feel they would help me survive. I don't think there is any one thing that I really truly fear. I am a qualified scuba diver. I am an absolute perfectionist; I love things being organised and am a little OCD at times. I have partial hearing loss; I have a condition called auditory processing disorder. I have a scar on my lip from falling off some stilts when I was 6 and splitting my lip open. I can't say the word anemone. I am addicted to diet coke and tea (very bad lots of caffeine). My dream car is a split screen VW camper van (in turquoise and white). I used to be a brunette (really glad I went back blonde). I have German heritage but can't speak the language sadly! I am a newly qualified speech and language therapist. I've tried to stick with blogs under 200 followers... I've mostly gone of Bloglovin' followers but I wasn't sure on numbers for some. If you could only wear one nail polish for the rest of your life what would it be? Do you prefer books or films? What would your perfect day be; How would you spend it? What was the last nail polish you purchased? Ooh I loved reading this post. It's so fun to be a little nosey and find out loads of info about the person behind the nails! I also love reading HP and am constantly re-watching One Tree Hill. I loved your questions too. I'm so sorry Rachel I don't know how I'm only just seeing this, I've been so busy the past couple of weeks and I'm only just catching up on my blog reading! Thank you so much for the nomination :) I also got one from Vicky so I will try and combine the two sets of questions when I write my post. I enjoyed reading all your answers (I'm evidently quite nosy!) and I'm totally with you on HP!